Coalition members engaging in workgroups meant to highlight unconscious bias in the workplace. January is a time for a fresh start and a chance to shake off the dust and get ready to work refreshed. With the new year comes new year’s resolutions, and personal goals that one wishes to focus on in the upcoming months. CDRW is among those joining in the new year traditions and, with the help of exemplary representatives of our various member groups, we are excited to announce that we have adopted an official list of our 2019 priorities! PA State leads discussing local issues and focuses. Members from across the four-state region of the Watershed came to join CDRW at its annual member meeting on January 23 at Audubon Pennsylvania’s newly opened facility, the Discovery Center in Philadelphia, Pennsylvania. This is an annual event in which representatives from our member organizations come together to celebrate successes and discuss issues important to themselves and the Delaware River Watershed. Through these discussions and member input, CDRW will be able to decide which issues we believe are valuable in advocating for and tackling in the upcoming year. The day started with a round table discussion with CDRW’s steering committee, in which we discussed the priorities that would be brought up in the upcoming meeting. Afterwards, members came together for meetings on a state level, in which our NJ and PA State Leads led discussion about issues and priorities that directly affect their local communities. As the day progressed, several engaging speakers took the microphone to nominate 2019 policy priorities for the upcoming year. The full slate of priorities were adopted unanimously by the Coalition. Priorities included a continuation of work on the Delaware River Basin Restoration Program, Land and Water Conservation Fund, Wild and Scenic Rivers Partnership Program, watershed-wide planning, and constituency building efforts. CDRW also adopted a brand new priority for 2019 - amplifying efforts to reduce and prevent single-use plastic from entering the watershed. Executive Director of Bartram’s Gardens, Maitreyi Roy, addressing Coalition members. A haven for not only diverse wildlife and flora, the Delaware River Watershed is a boon for the economy and provides approximately 15 million people with clean drinking water every day. Thus, this year’s policy priorities illuminate the ongoing and new efforts underway to actively protect and safeguard this critical resource for future generations of people and wildlife. In the afternoon, CDRW’s own project coordinator Katharina Miguel led an eye-opening workshop focused on the coalition’s newest workgroup, Diversity, Equity, Inclusion, and Justice (DEIJ). 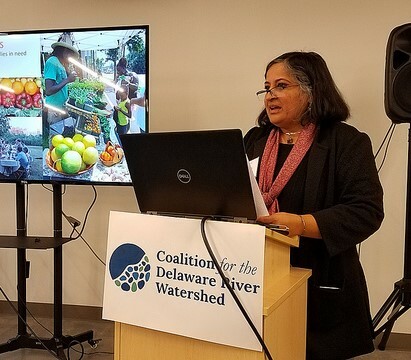 It started out with a presentation from Bartram’s Garden’s Executive Director, Maitreyi Roy about connecting the diverse community of Southwest Philadelphia and inspiring community members to connect with their local environment through recreation, agriculture, and more. CDRW members then worked in groups to discuss unconscious biases and brainstormed methods to ensure their organizations are promoting inclusive practices and allowing all to share their voice equally. Coalition staff are tremendously thankful for the input of our member organizations and are excited to put our nose to the grindstone to work on advocating for this year’s newly adopted priorities! For a full list of this year’s priorities, please click here! View from the Observation Tower of the Discovery Center.